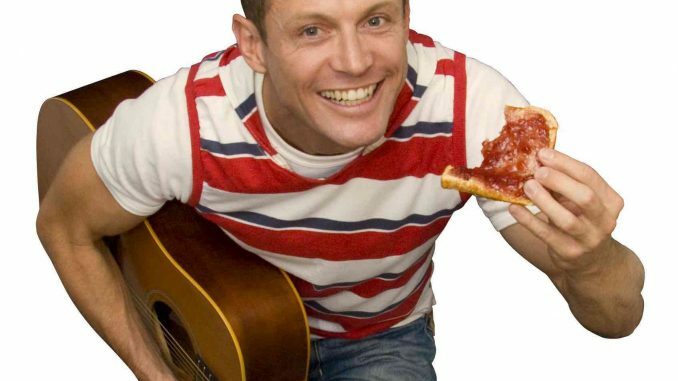 Inspiring kids through original songs and a live interactive musical journey, children’s performer Jamie has been spreading joy (and jam) for years. Releasing songs on his Jam on Toast albums, Jamie has educated and enlivened many kids across the country, and will be bringing his ___ vibes to Summer Hill Neighbourhood Feast this month. He speaks to Ciao about his most rewarding moments, the necessity of Russian Caravan tea, and shares his recipe for Strawberry and Vanilla Jam. What inspired you to become a children’s musician and entertainer? I had heard the saying ‘never work with children or animals’ and I needed to find out why. Now I know. And I love it. They have pure joy, curiosity and they are like sponges — I can teach them to have a love of creativity and music. But now I have to become a vet or zoologist, to find out about working with animals. I think they have a lot in common with children… especially at 5pm. What do you love about working and living in the Inner West? The people. They are generally so down-to-earth and just have a good appreciation for the good things in life, like music and food. And they don’t pout when they take selfies. Can you describe moments in your job that you find particularly rewarding? When I perform my music, watching a whole bunch of little hands and feet moving without any inhibitions and singing at the top of their lungs to some ridiculous words I wrote is just the best. It gets me every time! Adults could learn a lot from children. Find your inner child and come sing and dance with me. Is there anything that sets Inner West kids apart from others you’ve met around the country? The responses I get to one of my songs called ‘Grow Up’, where I ask what children would like to be when they grow up, usually gives the feeling of what children (and their parents) are like! I usually get football players, a princess or Spiderman. In some places I get the response, “I want to be a truck”. Special. But the Inner West kids usually say everything from an actor, to a chef, to a video game maker, to a doctor. Enough said. What are your top tips for those who wish to pursue music or music education? Practice, practice, practice. Yes, that includes your scales too — they are like vegetables. Music is a total joy, but it is also a lot of devoted time, energy, focus and hard work. But the rewards are so amazing. I thought it was something a few people got to really know the inner workings of, like some secret society with codes! And love the instrument you play. I have also been fortunate enough to have some amazing teachers, mentors and inspirations along the way. Listen to them carefully. What’s your meal of choice to prepare you for an energetic performance? A pot of Russian Caravan tea with a couple of slices of jam on toast of course! I just cracked a jar of strawberry and vanilla jam, and a jar of mandarin marmalade. There’s usually bananas nearby afterwards as well. Crush the strawberries with a potato masher in a large saucepan or stockpot. Add caster sugar, lemon juice and scraped vanilla bean. Stir over low heat until the sugar is dissolved. Increase heat to high and bring the mixture to a full rolling boil. Stir often as it bubbles, until the mixture reaches 105 degrees Celsius (this should take about 15 minutes). Keep stirring so the bottom does not burn and be patient! Transfer to sterile jars (*see note below), leaving 1cm headspace and seal. Process any unsealed jars in a cold water bath to help it set to become like jelly. If the jam is going to be eaten right away, don’t bother with processing and just refrigerate. *A little advice: you can store the jam in any jars you have but make sure that you sterilise them by putting the glass and lids in boiling water to get all germs off. Using tongs or silicon mitts, place them on clean kitchen towel upside down and make sure that you don’t touch the inside of the jar or lid, otherwise you will most likely end up with mould in your jam! Once the jam is in the glass, screw the lid on and place them upside down for about 10 minutes. This way the jam will stay good for months!